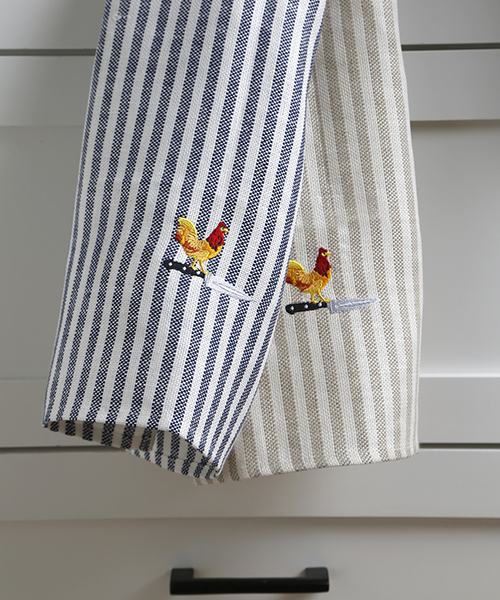 Custom embroidered with our popular chicken and knife logo, these classic beige and white, or deep blue and white striped 100% linen towels will make a handsome but durable addition to your kitchen. Once you've used linen, there's no going back! They are the most absorbent for drying dishes, and with use they become softer which is a quality of natural linen…it promises to be your favorite kitchen towel! Comes folded with our KATZ ribbon. 18" x 25"